Amy Clampitt was born on June 15, 1920, and brought up in New Providence, Iowa. Clampitt was the first born of five children. Both her father and her paternal grandfather were farmers. She graduated from Grinnell College, and from that time on lived mainly in New York City. 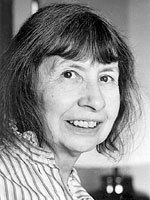 Her first commercially published volume of poems, The Kingfisher, published in 1983, was followed in 1985 by What the Light Was Like, in 1987 by Archaic Figure, and in 1990 by Westward. A Silence Opens was her last book which appeared in 1994. Do you have any comments, criticism, paraphrasis or analysis of this poem that you feel would assist other visitors in understanding the meaning or the theme of this poem by Amy Clampitt better? If accepted, your analysis will be added to this page of American Poems. Together we can build a wealth of information, but it will take some discipline and determination.